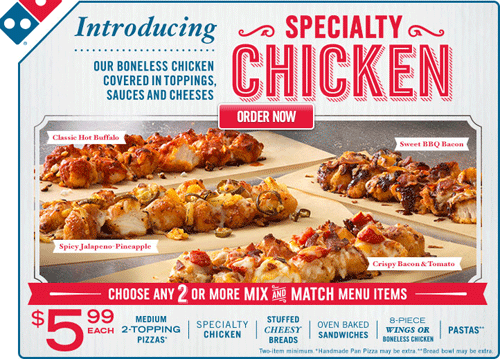 Earlier this week, we had the opportunity to try Domino's newest menu addition, Specialty Chicken. These are crisp, breaded chicken that are topped with a variety of cheeses, sauces and other ingredients to put them over the top. It's like a great low carb alternative to their pizza menu and overall, we thought it was a creative spin. The Specialty Chicken menu offers four different options: Classic Hot Buffalo, Sweet BBQ Bacon, Spicy Jalapeno Pineapple and Crispy Bacon & Tomato. We chose to try two of these flavors for a quick impromptu dinner and to make a meal of them, I prepared a couple sides to pair them up with. The Crispy Bacon & Tomato (lower left photo) was good and we enjoyed it with garlic cream macaroni. The chicken was covered in a garlicky white sauce, then topped with a mixture of cheddar and mozzarella cheeses, along with a sprinkling of bacon and chopped tomato. I liked how it wasn't completely covered with 'stuff' and you could actually enjoy it as a chicken dish. The garlic cream macaroni highlighted the garlic sauce used on the chicken nicely. The Sweet BBQ Bacon (lower right photo) was also good and we enjoyed it with cheddar smashed potatoes. The chicken had a nice sweet and smoky BBQ sauce drizzled over it along with some bits of bacon and a nice layer of cheese. This was our favorite of the two and serving it with cheddar smashed potatoes helped balanced the sweetness of the BBQ sauce. If ordered alone, these make for a good snack... however if you're looking for a meal, you'll want to pair it up with something else. When you're ordering a pizza, this would be a good item to add to your order for those who want a lower carb alternative. Thank you to the folks at Domino's for giving us the opportunity to try the new Specialty Chicken! 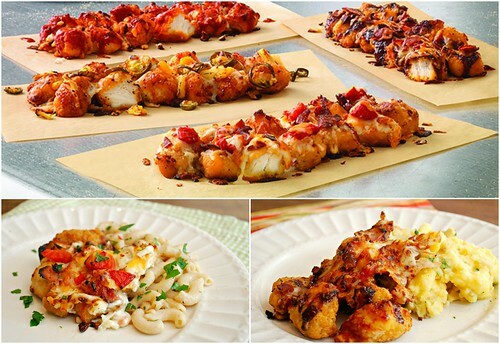 Not sure if you have had the Wing Street wings from Pizza Hut since they don't seem very gluten friendly but I'm wondering how they compare to the Domino's options.